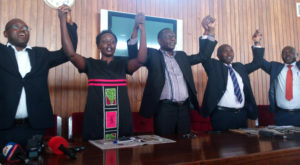 L-R: Wilfred Niwagaba (Ndorwa West), Monica Amoding (Kumi Woman), Felix Okot Ogong (Dokolo county), Theodore sekikubo (Lwemiyaga) and Barnabas Tinkasimire (Buyaga west) are some of the MPs against the lifting of the age limit. PML Daily photo. Two of the four legislators who are against the lifting of Presidential age limit this morning appeared at CID headquarters in Kibuli amid heavy deployment to record statements over allegation that they are inciting the public to storm Parliament. The duo are Muhammad Nsereko and Allan Ssewanyana. Barnabas Tinkasimire and Theodore Ssekikubo did not appear at Kibuli police. When he stepped at Kibuli Police, Nsereko said they are ready to interact with the Police officers. “But we expect it to be brief because we have other businesses at Parliament at 2pm,” he added. Yesterday, Ssekikubo told PML Daily that he wanted the Police to first arrest Evelyn Anite, the Koboko Municipality Woman MP, for trying to cause Constitutional crisis by involving the army in partisan politics. Currently, there is a contentious issue on whether Article 205(b) of the Constitution should be amended to allow those above 75 years to contest for the Presidency. Last week, some NRM MPs and ministers convened and agreed to support the move to lift the age limit. If the legislators win the battle in Parliament, it means President Museveni will contest in 2021. Some legislators vowed to use any means to block any move by Parliament to amend Article 205(b) of the Constitution to lift the Presidential age limit. While appearing before Police, Ssewanyana said he has no case to answer and is free to speak his mind. “As an elected leader that’s what I’am supposed to do,” he said. 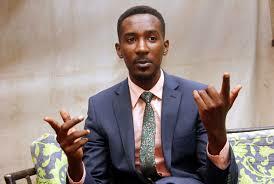 Allan Ssewanyana is one of the MPs who appeared for questioning at Kibuli police headquarters. Courtesy photo. Sources at Parliament told PML Daily that this matter will have to be concluded before this year’s Independence celebrations. Police said it gathered information showing how the five MPs are using the media to organise the public to storm Parliament at the time of discussing the age limit. Meanwhile, the summoned legislators suspect that their colleagues on the other side, could be trying to trick them and change the date for tabling the Bill. Addressing press before the interrogation at Kibuli, Aruu County MP Odonga Otto who among other MPs escorted the duo, claimed to have caught wind of plans by the NRM MPs to table the Amendment Bill this afternoon. “We did not want to be taken unawares. We could not keep all our eggs in one basket,” Odonga said, in reference to Ssekikubo and Tinkasimire’s failure to appear before police. The bill is scheduled for Thursday, according to the laid out plan. Yesterday, the Inter -Religious Council of Uganda called for a referendum on the age limit to allow the citizens to participate. The religious leaders argue that the age limit debate goes beyond partisan politics and citizens with divergent views must be listened to before any amendments are considered.